As Baltimore water bills rose for the third year in a row, jumping nearly 10% yesterday, advocates for water customers again asked city officials to give poor residents some relief. Last summer they made the same plea for income-based billing legislation – and thought they were being heard. Council President Bernard C. “Jack” Young promised then to work with advocates on a measure that would limit rates for poor customers. But after a couple of months, those talks petered out and no bill has been introduced. “Since January, there’s been no movement,” said Molly Amster, of Jews United for Justice. A news conference held under a blasting-hot July sun in front of City Hall today drew about 25 activists, faith leaders, labor leaders and water customers. 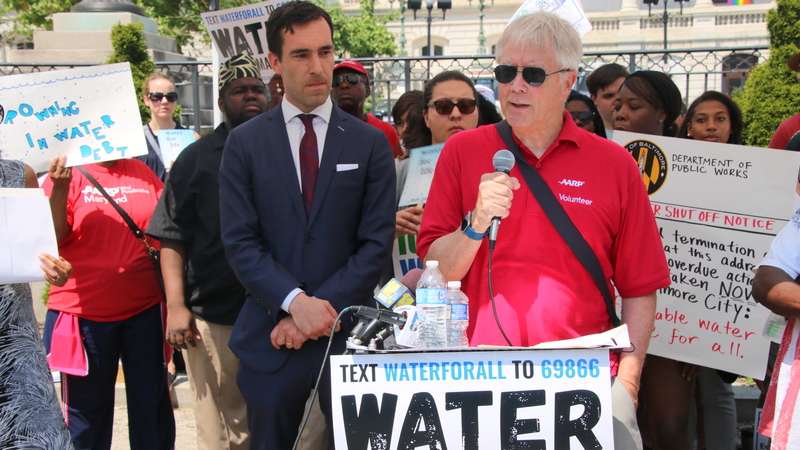 “Now our city’s residents can only expect to see more water shut-offs and more tax sales for deeply un-affordable water bills,” said Rianna Eckel, Maryland organizer for Food & Water Watch. She was joined by two ministers who said their churches were hit by attempted property tax sales as a result of erroneous water bills. “There has got to be a creative way where we don’t put elderly people out on the street at the threshold of $750,” said Rev. Mark James, pastor of Barnes Memorial Church. “DPW and the mayor are capable of addressing the affordability crisis right now with their administrative authority” – Molly Amster. Gesturing towards City Hall, speakers said Mayor Catherine Pugh and the Department of Public Works are responsible for leaving water customers with the burden of soaring rates and sometimes inaccurate bills. “DPW and the mayor are capable of addressing the affordability crisis right now with their administrative authority,” Amster said. Council members Zeke Cohen and Shannon Sneed were among those in attendance. Cohen said he received 330 requests for help on water bill issues, the single largest category of customer complaints from his 1st District constituents. “Each request represents a family in Fells Point dealing with an erroneous bill, an elderly citizen in Eastwood who can no longer afford to pay their bill or a couple in Canton whose meter is defective,” Cohen said. A councilman gets 330 requests for help on water bill issues, the single largest category of customer complaints from his constituents. 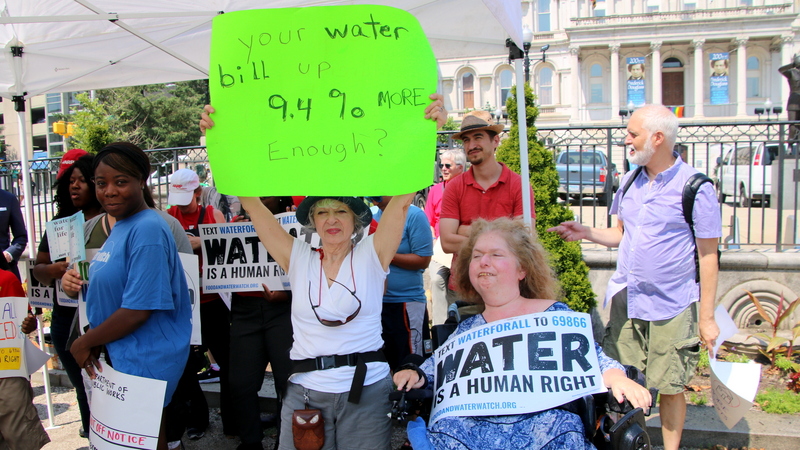 Even before the July 1 hike took effect, more than a third of families in the city were being billed more than 3% of their household income for water service in violation of United Nations standards, today’s speakers noted. In October 2016, city water and sewer bills began the first of three roughly 10% yearly water and sewer hikes, which over three years would represent an increase of 30%. The rate increases were needed, according to DPW, to overhaul aging infrastructure so that the city could comply with a federal mandate to end Baltimore’s multi-million-gallon annual sewage releases into local waterways. After Councilman Bill Henry held hearings in 2016 that drew wrenching testimony from citizens struggling to pay sky-high bills, Young said he would take the lead on legislation. Activists pushed for a measure that would give households with low incomes a break on rates, an approach they said resulted in more revenue and fewer delinquent bills and tax sales in Philadelphia and elsewhere. Why no legislation so far? Young’s spokesman, Lester Davis, said the Council president still supports water bill relief efforts, but the bill process has gotten behind schedule. Personnel changes and other pressing needs, such as reviewing the annual budget and proposed charter amendments, “created a bottleneck,” he said. He said a bill will be drafted “by August,” noting that his office has been in contract with activists in recent weeks. Mayor Pugh’s office did not return a request for comment today. 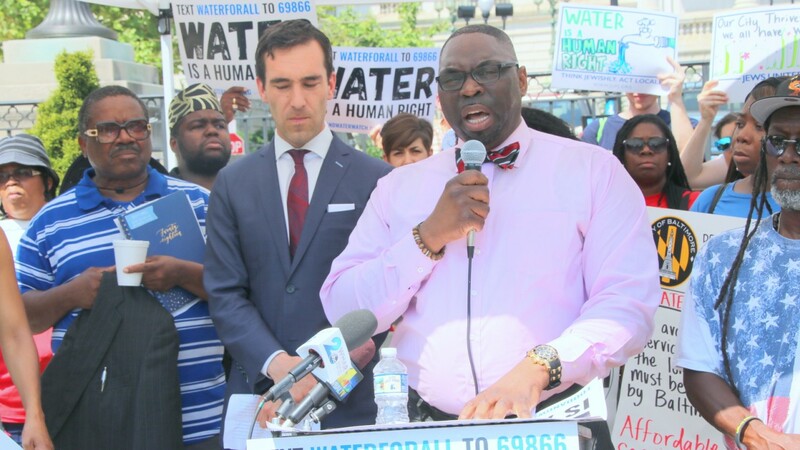 Addressing the crowd today, Keith Bailey, former pastor of the Greater Bethesda Missionary Baptist Church, recounted his struggles with an erroneous $85,000 water bill and tax lien. After wrangling with the city for years and going to Annapolis to testify about the West Baltimore church’s troubles, the bill was finally reduced to $200. “But what about that lien? They left it just the way it was. We had to struggle to pay that lien,” he said. While churches do have resources to fight such bureaucratic battles, individuals often don’t. “There are people in Fulton Heights losing their property for the same thing,” said Bailey, who is president of the Fulton Heights Community Association. A Fight for 15 organizer with the union 1199SEIU said spiking water rates add to the strain on working families that already struggling to survive on low wages. Echoing that theme, another speaker asking the city to provide relief to water customers was Jim Campbell, Maryland president of AARP.